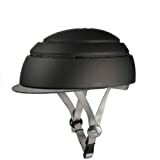 The problem with bicycle helmets is that not only do they look like goofy bicycle helmets, they also take up too much space when stored and are a pain to carry around when not riding. 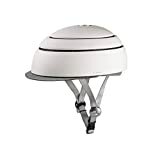 The solution is the cool new Closca Fuga - Collapsible Bike Helmet. 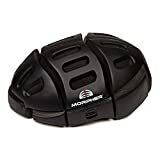 This sleek and innovative bike helmet safely protects your head while cycling, looks quite stylish while doing it, and then collapses down more than 50% to easily fit inside a backpack, briefcase, or handbag. 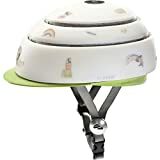 It features hidden air vents for ventilation, interchangeable visors to change up your look, rear adjustment for a great fit, double safety certified in the USA and EU, and stays locked while on your head. 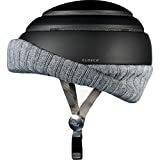 Sure you'll still look like an idiot flipping over the handlebars, but at least you'll look a bit cooler doing it and your noggin will have a high level of protection from the pavement.